Sometimes when I'm studying art history and how things came to be, I am surprised that the Renaissance artists "discovered" certain things because they seem so common to me. But like all things in the past, I am trying to peer through a 21st century looking glass and have absolutely no idea what life was really like back more than 500 years ago. Sometimes my ignorance gets in the way of my understanding. It surprised me that pre-Renaissance artists didn't "see" the light, so to speak. 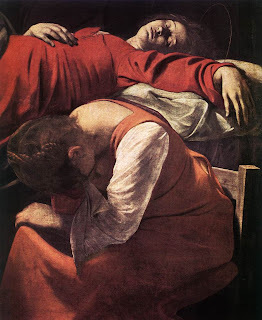 But after doing some further reading on the subject, I’ve learned that chiaroscuro originally wasn’t just about creating form or the illusion of space and depth, but instead it was the first time light created drama. Now a painting wasn’t just a replica of the world; now a painting was worth a 1000 words. A story unfolded before one’s eyes. Now I could see why this was a big deal. Up until then, paintings weren’t using light and shadow to create form or anything else for that matter. Even perspective wasn’t in use, so the idea of painting showing any kind of depth was hopelessly lacking. Then an explosion happened. 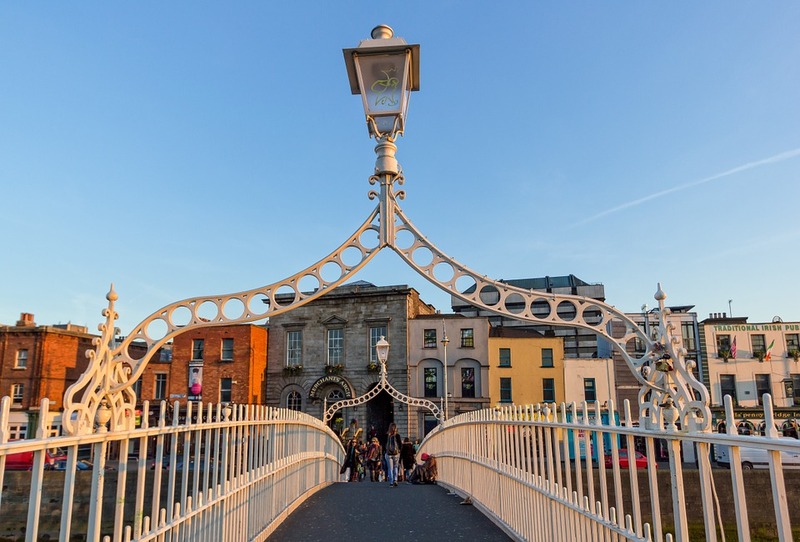 Europeans were introduced to some fantastic concepts (thanks to the Islam communities in Spain and Sicily), like math, physics and a whole slew of new ideas. 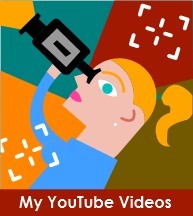 From then onward the world of art and science would never been the same. The Renaissance painters such as Leonardo da Vinci (1452 –1519) and Michelangelo Merisi da Caravaggio, (1571 to 1610) used light and dark to express not only form but also added excitement to their paintings. Let’s look at some paintings that were created in 14th century as opposed to ones that were painted less than three hundred years later. 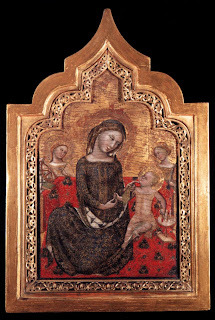 The first set of paintings were done in the 14th century. 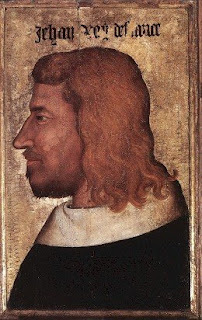 The Portrait of Jean le Bon, the King of France was completed by an unknown painter in 1360 and the Madonna del’Umita was created by Vitale de Bologna (1309-1360) in 1353. Now compare the next paintings created three centuries later using chiaroscuro. 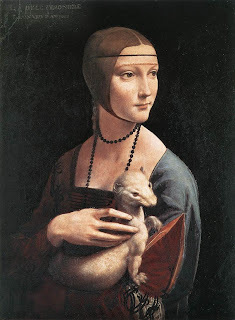 Da Vinci's Lady with an Ermine (above), painted in the late 15th century, is a perfect example of how light creates interest even for a simple setting. 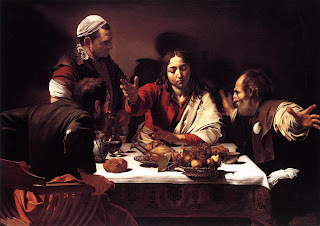 But the lighting master of the age--Carravaggio--really knew how to turn on the spotlight and create masterful dramatic pieces, such as Supper at Ammaus in 1601. 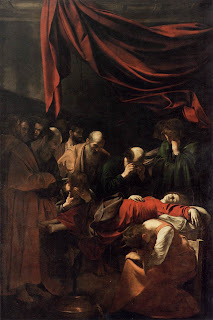 Another one of Caraviggio's paintings (above) also shows how skillful he was at chiaroscuro, The Death of the Virgin (1606). Notice on the close up how the light helps to depict the sadness, grief of the moment. I personally like some other masters of light and dark: Rembrandt Harmensz van Rijn (1606-1669) and Joseph Wright of Derby (1734-1797). 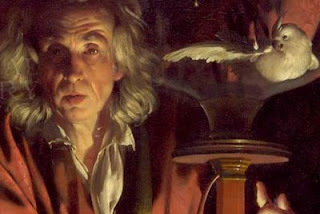 Below you'll see a couple of my favorites: Hendrickje Bathing in a River (1654) by Rembrandt and Experiment on a Bird in the Airpump (1768) by Wright--notice the close up and see the light. 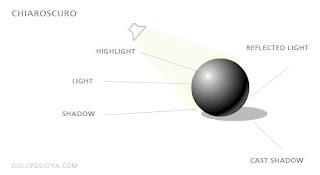 And finally, I ran across a wonderful website that discusses chiaroscuro in film making. 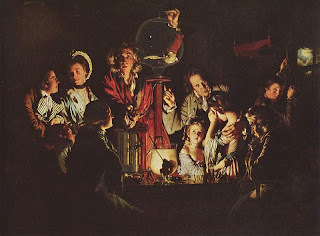 The author compares early paintings to scenes in some movies, very interesting and informative: http://www.bluesky-web.com/broadcastvideoexamples-Chiaroscuro.html.